Before you begin... 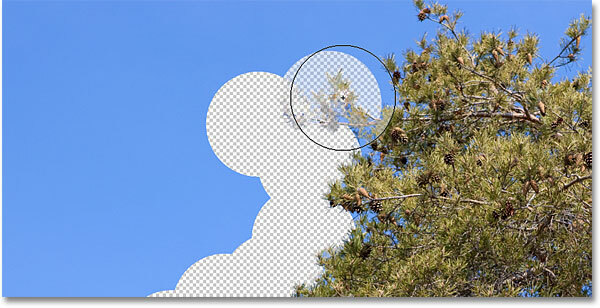 Please note that this version of the Background Eraser tutorial is for Photoshop CS5 and earlier. Using Photoshop CS6 or CC? Check out our fully updated Background Eraser tutorial. In this Photoshop tutorial, we look at the Background Eraser Tool and how we can use it to easily remove background areas of an image. The Background Eraser is especially useful with photos that contain lots of fine detail along the edges between the foreground and background, like, for example, if you want to erase the sky in an image without first having to select all of the trees below it. Don't let the name fool you, though. The Background Eraser really has nothing to do with erasing backgrounds, since Photoshop has no way of knowing what's considered the background in a photo and what isn't. It can just as easily be used to erase any part of an image, and that's because the Background Eraser is really a color eraser. It samples colors as you drag the tool over them and erases only those colors, leaving all other colors untouched. 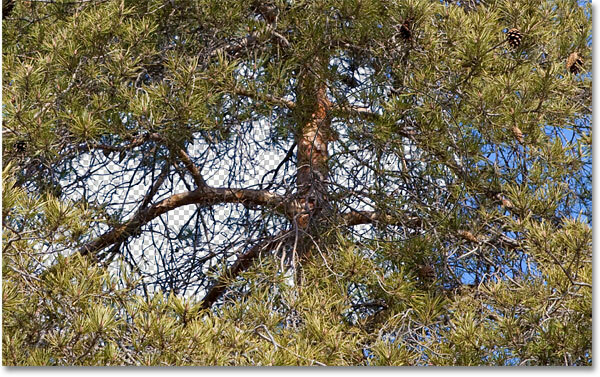 So if your sky is blue and your trees are green, the Background Eraser can easily erase the blue sky while leaving the green trees alone, at least until someone comes along and cuts them down, which makes it all the more important to protect them in your image. The Background Eraser is, without a doubt, one of the best tools in Photoshop for removing unwanted areas of a photo, but it's not perfect and it does have one serious drawback. As an eraser tool, it physically deletes pixels from the image, which means they're gone for good, so you'll definitely want to either duplicate your Background layer first before erasing any pixels or work on a separate copy of your image. You can adjust the size of the circle directly from your keyboard just as you can with Photoshop's other brush tools. Press the left bracket key ( [ ) to make the circle smaller or the right bracket key ( ] ) to make it larger. You can also adjust the hardness of the edges by adding the Shift key. Press Shift+left bracket ( [ ) to make the edges softer or Shift+right bracket ( ] ) to make them harder. In general, you'll want to use hard edges with the Background Eraser, since soft edges can leave many background artifacts behind. Let's say I want to erase the blue column in the middle of the image. The way the Background Eraser works (by default, anyway) is that Photoshop samples the color that's directly underneath the small target symbol in the center of the circle. 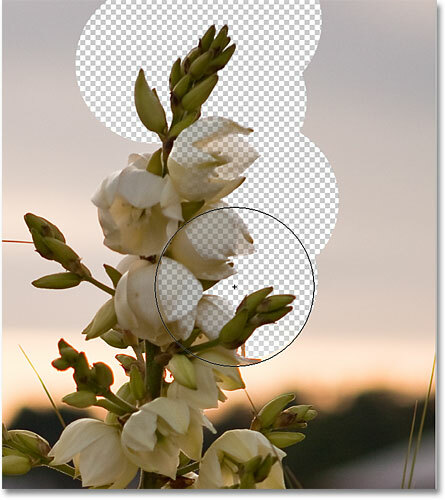 The larger circle surrounding the target symbol represents the area where Photoshop will erase pixels. Any pixels inside the circle that match the color of the pixel directly under the target symbol will be erased. Photoshop erases all of the pixels inside the circle that are the same color as the pixel under the target symbol in the center. You can move the circle into other colors in the image without erasing them as long as you keep the target symbol away from them. Moving the target symbol over a new color causes Photoshop to change the color that it's erasing. If you do make a mistake like this, simply press Ctrl+Z (Win) / Command+Z (Mac) to undo it. If you need to undo multiple steps, press Ctrl+Alt+Z (Win) / Command+Option+Z (Mac) repeatedly. Notice the checkerboard pattern that appears in place of the areas I've erased. That's Photoshop's way of representing transparency on a layer, which, if you're familiar with Photoshop, may have you wondering what's going on here. A moment ago, we saw that my image was sitting on the Background layer. Photoshop treats Background layers differently from normal layers, with different rules for what we can and can't do with them. One of the things we can't do is erase pixels on them, since transparency is not allowed on a Background layer (after all, it's the background, and not being able to see through it is part of what makes it a background). How, then, did I manage to erase the pixels? Is there some sort of "Extra Strength" setting for the Background Eraser we haven't looked at yet? 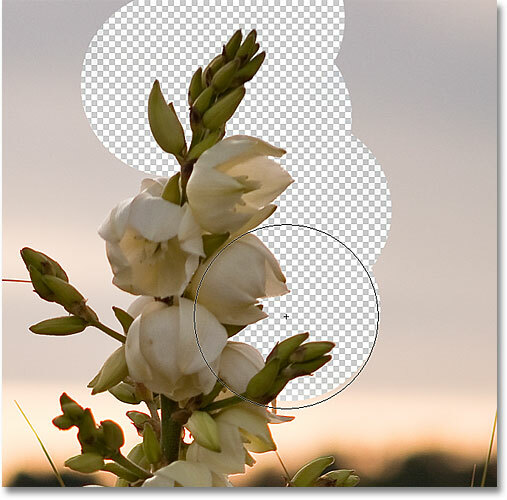 When using the Background Eraser on the Background layer, Photoshop converts it to a normal layer. 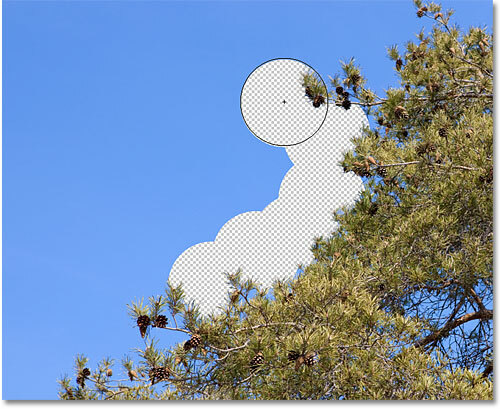 Even though the Background Eraser extends into the tree, only the blue sky is erased. 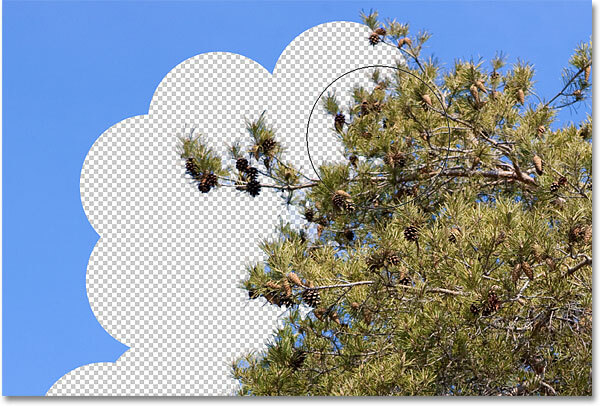 Photoshop has no idea what the sky or a tree is. It cares only about the color under the target symbol. So far, we know that Photoshop samples the color directly under the target symbol in the center of the Background Eraser's cursor, then it erases any pixels of that same color that fall within the larger circle. We also know that if we move the target symbol over a different color as we're dragging the Background Eraser around, Photoshop will sample the new color and use it as the color it should be erasing. What we've just described here is the default behavior of the Background Eraser, but it's not the only way the tool can behave. So how do we change things? We do that using the settings and options found in the Options Bar, which we'll look at next! Whenever we have the Background Eraser selected, the Options Bar along the top of the screen displays various options for controlling how the tool behaves. One of the most important behaviors we can change is how Photoshop samples colors under the target symbol, or if it samples them at all. From left to right: The Continuous, Once and Background Swatch sampling options. Of these three, the two you'll switch between the most are Continuous (the icon on the left) and Once (the middle icon). Continuous is selected by default, and it means that as we move the Background Eraser around, Photoshop continuously samples the color under the target symbol. That's why, when I accidentally moved the target symbol over the green column or the green tree, Photoshop started erasing green pixels in the image even though I was initially erasing blue pixels. Photoshop no longer erases the green column even though the target symbol has moved over the green color. Choose either Contiguous or Discontiguous for the Limits option. 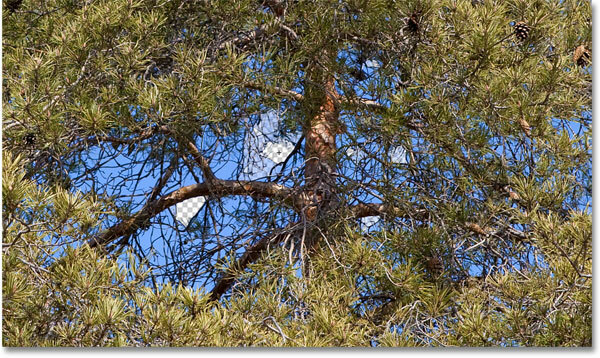 Some blue fringes still remain around some of the tree branches. This brings us to the third important option for the Background Eraser, and the one that can make all the difference when it comes to using the tool successfully - Tolerance, which we'll look at next! The default Tolerance value is 50% and that's usually a good starting point, but if you find that the Background Eraser keeps erasing part of the area you're trying to keep because the color of the background is too similar to your subject, try a lower Tolerance setting. If your background color is quite different from your subject, increase the Tolerance value. 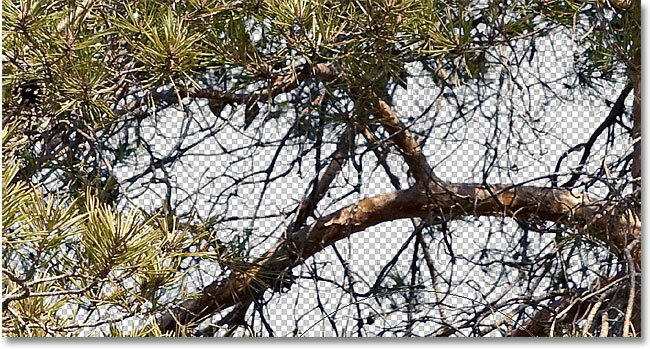 With a higher Tolerance setting, the Background Eraser was able to avoid the blue fringing along the branches. Click the checkbox to turn the Protect Foreground Color option. Click again to turn it off. The flowers in the image are being erased along with the background due to the similar colors. Hold down Alt (Win) / Option (Mac) and sample the color to protect with the eyedropper. And there we have it! 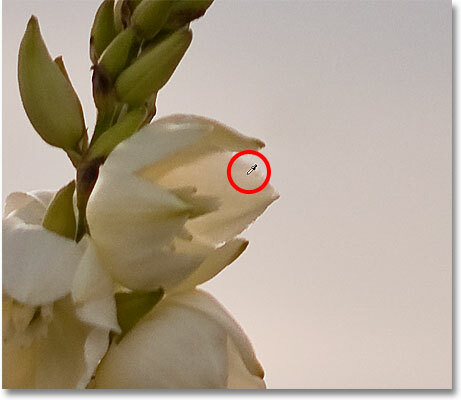 That's how to remove backgrounds with the Background Eraser Tool in Photoshop! Check out our Photo Retouching section for more Photoshop image editing tutorials!